The Southern California Institute of Architecture (SCI-Arc) presents Lebbeus Woods is an Archetype, curated and assembled by a team that included Eric Owen Moss, Hernan Diaz Alonso, Dwayne Oyler, Alexis Rochas, and Christoph a. Kumpusch. 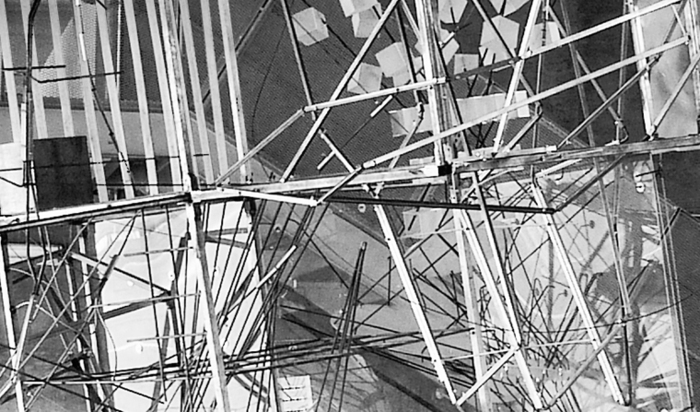 This exhibition, symposium, and accompanying catalogue explore the work of Lebbeus Woods, an influential architect, abstract thinker, mentor, and teacher. The project provides an examination of Woods beyond a cult figure and helps to advance his ideas with a generation of younger architects, students, and the public. A SCI-Arc gallery exhibition of previously unseen drawings and a rarely seen videotaped interview is presented in conjunction with an outdoor installation in the Los Angeles Arts District. Visiting artist Christoph A. Kumpusch has directed the completion of a large-scale steel structure, originally commissioned for the 2009 Biennale of Architecture and Art of the Mediterranean. A public symposium featuring a panel of young architects who studied under Woods and a fully illustrated catalogue accompanies the exhibition. 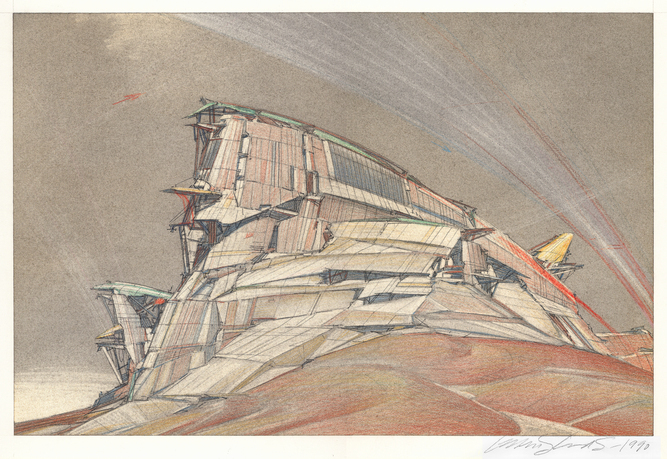 Lebbeus Woods (1940–2012) was an architect and artist. Woods studied architecture at the University of Illinois, engineering at Purdue University, and first worked in the offices of Eero Saarinen. In 1976, he turned exclusively to theory and experimental projects and, in 1988, he cofounded the Research Institute for Experimental Architecture, a nonprofit institution devoted to the advancement of experimental architectural thought and practice while promoting the concept and perception of architecture itself. The majority of his explorations deal with the design of systems in crisis: his designs are politically charged and provocative visions of a possible reality. Woods taught at Cooper Union and the European Graduate School in Switzerland. 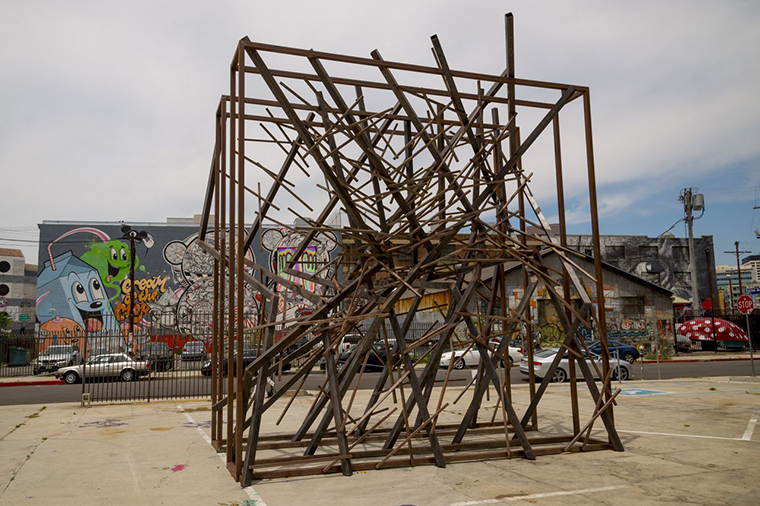 He also was a visiting faculty member at SCI-Arc, where in 2003, he and several students stealthy recreated his Foundation Cartier installation, drilling a field of 1,400 steel rods into the concrete floors throughout SCI-Arc's quarter-mile long building. Eric Owen Moss, cocurator, is founder and principal of Eric Owen Moss Studios, Los Angeles. He is the recipient of over one hundred design awards, including the 1999 Award in Architecture from the American Academy of Arts and Letters, the 2001 AIA/LA Gold Medal Award, and the AIA/LA 25-Year Award for Petal House. He is a fellow of the American Institute of Architecture and received the Distinguished Alumni Award from the University of California, Berkeley, in 2003. In 2011, Moss received the Royal Institute of British Architect's Jencks Award. In 2010, he became the first foreign architect invited to curate the Austrian Pavilion at the Venice Biennale. Moss first taught at SCI-Arc in 1974 and was appointed director in 2002. He received a BA from University of California, Los Angeles, and MArch degrees from both University of California, Berkeley, and the Harvard University Graduate School of Design. Hernan Diaz Alonso, cocurator, is founder of the Los Angeles–based design practice Xefirotarch. Considered one of the most influential voices of his generation, he is currently the SCI-Arc Graduate Programs Chair and a distinguished professor of architecture. He has previously taught at Columbia University, the Universität für angewandte Kunst Wien, and Yale University, where he held the Louis I. Kahn Visiting Professorship. Diaz Alonso lectures extensively and his work is widely published, including his monograph, Xefirotarch: Excessive (Huazhong University of Science and Technology Press, 2008). His design work was the subject of a recent solo show at the Centre Georges Pompidou as well as previous solo shows at the San Francisco Museum of Modern Art, the Art Institute of Chicago, and the MAK Centre, Vienna. Diaz Alonso's work is part of the permanent collections of the FRAC Center, Orléans, France; SFMOMA; and the Art Institute of Chicago. He completed his undergraduate degree at the Universidad Nacional de Rosario and holds a master's in advanced architectural design from Columbia University. Christoph a. Kumpusch, visiting artist, is a New York–based architect, principal of cak-productions, and director of Forward-slash, an interdisciplinary practice. He also is a professor of architecture at Columbia University's Graduate School of Architecture, Planning, and Preservation and previously taught at Cooper Union, Cornell University, the Ohio State University, Pratt, and Guangzhou University in China. A current Leonardo da Vinci Fellow and a Rudolf M. Schindler Scholar, Kumpusch has published The Light Pavilion (2013), Detail Kultur (2012), and System Wien (with Lebbeus Woods, Anthony Vidler, and Manuel DeLanda, 2005). He is currently editing Steven Holl: Urban Hopes. Kumpusch's built work includes the Light Pavilion, in collaboration with Lebbeus Woods and Steven Holl Architects, in Chengdu, China. Current projects include a community embassy in Kenya and a social housing tower in Budapest. Kumpusch holds a PhD in architecture and technology from the University of Applied Arts in Vienna. Hsinming Fung, director of academic affairs, provides overall institutional leadership. Fung cofounded Hodgetts+Fung in 1984 and has since designed and built such critically acclaimed projects as the new Hollywood Bowl, Hyde Park Library, the historic Egyptian theatre, and the Wild Beast Pavilion at CalArts. Recently, Hodgetts+Fung was selected to design the Living in a Modern Way exhibition at the Los Angeles County Museum of Art. Fung is the recipient of the Rome Prize for Advanced Fellowship and was appointed to the National Council on the Arts under President Clinton. She received a BA from California State University, Dominguez Hills, and an MArch from University of California, Los Angeles. Dwayne Oyler, SCI-Arc design faculty member, is a project collaborator for the gallery exhibition and outdoor installation. Oyler established Oyler Wu Collaborative with Jenny Wu in 2000. He has collaborated with Lebbeus Woods on several projects and has worked in the office of Toshiko Mori. Oyler was awarded the Skidmore, Owings, and Merrill Traveling Fellowship in 1996 and has taught at Cooper Union and the Research Institute for Experimental Architecture in Vico Morcote, Switzerland. He received a BArch from Kansas State University and an MArch from the Harvard University Graduate School of Design. Alexis Rochas, SCI-Arc design faculty member, is a project collaborator for the gallery exhibition and outdoor installation. Rochas is the founder of I/O, a Los Angeles–based practice. His work has been exhibited regionally and internationally, and he has been published in a number of architectural journals. A member of the SCI-Arc design faculty since 2003, he has coordinated SCI-Arc's Making+ Meaning—the school's intensive summer introduction to architecture—since 2006. Rochas is the recipient of a City of Los Angeles Design Award and a New York Society of Architects Award for Excellence in Total Design. SCI-Arc's mission is re-imagining the edge: educating architects to engage, speculate, and innovate. Established in 1972 as an experimental alternative to traditional architecture education, SCI-Arc was accredited by the National Architecture Accrediting Board in 1976 and by the Western Association of Schools and Colleges in 1995. Widely regarded as one of the top architecture schools in the world, SCI-Arc educates architects and designers who will imagine and shape the future of our built environment.